Seventh-ranked Al Ahli (4-10) used its home court advantage to challenge third ranked Qatar Sports Club (11-3) in Doha on Sunday. The visitors managed to secure only one-point victory 80-79. However their fans expected much easier game. Qatar Sports Club looked well-organized offensively handing out 25 assists. Great defensive blocking was one of the keys in this match when Qatar Sports Club made 8 blocks. American guard Jeff Newberry (188-92, college: Oklahoma St.) saved the victory by scoring 23 points and 5 assists. The other American import guard Kevin Bracy-Davis (201-95, college: Davis & Elkins) contributed with 18 points, 6 rebounds and 5 assists for the winners. American Julius Coles (193-89, college: Canisius) replied with a double-double by scoring 19 points, 11 rebounds and 8 assists (was perfect 10-for-10 from the free throw line !!!) for Al Ahli. Qatar Sports Club maintains third position with 11-3 record having just one point less than leader Al Sadd. Al Ahli lost third consecutive game. They keep the seventh place with ten games lost. Qatar Sports Club's supporters look forward to an exciting derby game next round, where their team will travel locally in Doha to the arena Al Arabi. Another interesting game was a derby match between two teams from Doha: Al Sadd (#2) and Al Arabi (#4). Al Arabi was defeated at home 66-79 and even the fact of playing on their own court did not help. It ended at the same time the two-game winning streak of Al Arabi. American point guard Dominic James (180-86, college: Marquette) had a double-double by scoring 22 points, 12 assists and 6 steals to lead the charge for the winners and Miroslav Todic chipped in 25 points and 9 rebounds during the contest. Senegalese center Oumar Seck (208-88) responded with a double-double by scoring 18 points and 19 rebounds. Al Sadd have a solid four-game winning streak. They keep a position of league leader, which they share with Al Shamal. Defending champion Al Arabi keeps the fourth place with six games lost. Al Sadd will play against Al Wakrah (#5) on the road in the next round. Al Arabi's supporters look forward to another derby game next round, where their team will face at home their local rival from Doha Qatar Sports Club. The game in Doha was also quite interesting. 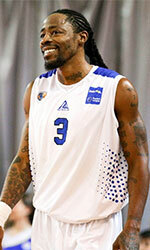 5th ranked Al Wakrah (7-6) played at the court of sixth ranked Al Gharafa (6-7). Al Gharafa managed to secure a 6-point victory 97-91 on Saturday. Franklin Session notched a double-double by scoring 32 points, 6 rebounds and 12 assists to lead the effort. Even 27 points, 5 rebounds and 9 assists by DaQuan Brooks did not help to save the game for Al Wakrah. Al Gharafa maintains sixth position with 6-7 record. Al Wakrah at the other side keeps the fifth place with six games lost. Al Gharafa's supporters look forward to an exciting derby game next round, where their team will face at home their local rival from Doha Al Shamal. In the last game of round 14 Al Khor was beaten by Al Shamal on the road 79-73. Another interesting game was a derby match between two teams from Doha: Al Sadd (#2) and Al Arabi (#4). Al Arabi was defeated at home 66-79 and even the fact of playing on their own court did not help. It ended at the same time the two-game winning streak of Al Arabi. Al Sadd forced 22 Al Arabi turnovers. Strangely Al Arabi outrebounded Al Sadd 43-30 including 28 on the defensive glass. American point guard Dominic James (180-86, college: Marquette) had a double-double by scoring 22 points, 12 assists and 6 steals to lead the charge for the winners and Bosnian-Serbian power forward Miroslav Todic (205-85) chipped in 25 points and 9 rebounds during the contest. Senegalese center Oumar Seck (208-88) responded with a double-double by scoring 18 points and 19 rebounds and the former international swingman Khalid Abdi (198-87) produced a double-double by scoring 19 points, 10 rebounds and 4 assists. Four Al Arabi players scored in double figures. Al Sadd have a solid four-game winning streak. They keep a position of league leader, which they share with Al Shamal. Defending champion Al Arabi keeps the fourth place with six games lost. Al Sadd will play against Al Wakrah (#5) on the road in the next round. Al Arabi's supporters look forward to another derby game next round, where their team will face at home their local rival from Doha Qatar Sports Club. No shocking result in a game when second ranked Al Shamal (11-2) beat 8th ranked Al Khor (1-12) in Doha 79-73 on Saturday. However just six-point win is not that big difference and the fans of host team counted on more convincing victory. Al Shamal looked well-organized offensively handing out 25 assists. Egyptian guard Omar Salem (190) notched 36 points (!!!) and 7 rebounds (perfect from downtown making all six shots !!!) to lead the effort and American guard Aaron Mitchell (188-89, college: Longwood) supported him with 17 points, 12 rebounds and 9 assists. Even a triple-double of 16 points, 11 rebounds and 11 assists by American point guard Ameer Jackson (193-94, college: Winston Salem) did not help to save the game for Al Khor. His fellow American import forward Da'Quan Cook (205-87, college: St.Bonaventure) added 22 points, 8 rebounds and 4 assists for the guests. Al Shamal have a solid three-game winning streak. They keep a position of league leader, which they share with Al Sadd. Al Khor lost eighth consecutive game. They keep the eighth place with 12 games lost. They share the position with Al Rayyan. Al Shamal's supporters look forward to an exciting derby game next round, where their team will travel locally in Doha to the arena Al Gharafa. Seventh-ranked Al Ahli (4-10) used its home court advantage to challenge third ranked Qatar Sports Club (11-3) in Doha on Sunday. The visitors managed to secure only one-point victory 80-79. However their fans expected much easier game. Qatar Sports Club looked well-organized offensively handing out 25 assists. Great defensive blocking was one of the keys in this match when Qatar Sports Club made 8 blocks. American guard Jeff Newberry (188-92, college: Oklahoma St.) saved the victory by scoring 23 points and 5 assists. The other American import guard Kevin Bracy-Davis (201-95, college: Davis & Elkins) contributed with 18 points, 6 rebounds and 5 assists for the winners. American Julius Coles (193-89, college: Canisius) replied with a double-double by scoring 19 points, 11 rebounds and 8 assists (was perfect 10-for-10 from the free throw line !!!) and Guamanian-American guard Earnest Ross (196-91, college: Missouri, agency: Haylett Sports) added 23 points, 5 rebounds, 5 assists and 4 steals in the effort for Al Ahli. Both teams had four players each who scored in double figures. Qatar Sports Club maintains third position with 11-3 record having just one point less than leader Al Sadd. Al Ahli lost third consecutive game. They keep the seventh place with ten games lost. Qatar Sports Club's supporters look forward to an exciting derby game next round, where their team will travel locally in Doha to the arena Al Arabi. The game in Doha was also quite interesting. 5th ranked Al Wakrah (7-6) played at the court of sixth ranked Al Gharafa (6-7). Al Gharafa managed to secure a 6-point victory 97-91 on Saturday. American guard Franklin Session (187-89, college: CS Los Angeles) notched a double-double by scoring 32 points, 6 rebounds and 12 assists to lead the effort and naturalized Bosnian forward Nedim Muslic (197-99) supported him with 35 points (!!!) and 11 rebounds. Even 27 points, 5 rebounds and 9 assists by American point guard DaQuan Brooks (177-90, college: W.Connecticut) did not help to save the game for Al Wakrah. His fellow American import guard Jordan Downing (196-92, college: Presbyterian) added 21 points, 6 rebounds and 4 assists for the guests. Four Al Wakrah players scored in double figures. Al Gharafa maintains sixth position with 6-7 record. Al Wakrah at the other side keeps the fifth place with six games lost. Al Gharafa's supporters look forward to an exciting derby game next round, where their team will face at home their local rival from Doha Al Shamal.